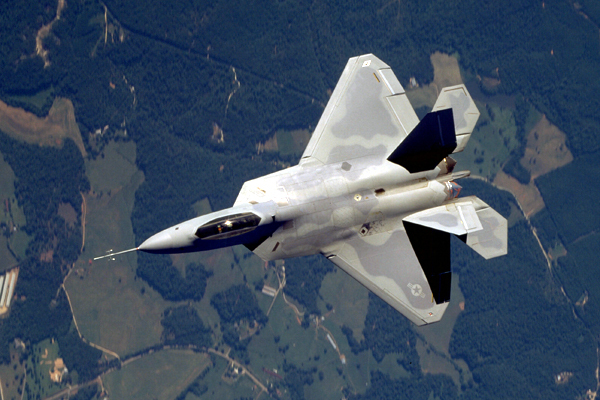 For many years now I have had a F-22 Raptor obsession, I would buy one if I had the money and I screamed like Japanese schoolgirl when I saw F-22s in the Transformers movie. I blogged a long while back that America was refusing to sell F-22 Raptors to Japan, it’s closest Asian ally and it that time the likelihood of Japan being able to acquire the state of the art air dominance stealth fighter which costs 9 billion yen each have been becoming less and less. The basic explanation (excuse) for why America refuses to sell F-22 Raptors to Japan is two words “security concerns”. The long explanation is they don’t want a foreign power possessing comparable if not more advance technological capabilities acquiring their ideas and a working specimen and then making a superior fighter in a decade or two as Japan already likes to manufacture combat aircraft on it’s own soil using it’s own facilities after acquiring the license and green light from U.S. contractors. Also what if Russia, Iran or Venezuela got their hands on a a F-22’s stealth, weaponry or related technology? It was branded by the higher ups in the US congress as massive high level technological secret for a reason and America won’t share this one, not even with their Japanese friends. I still can dream of seeing one in the future though, maybe Jamaica should declare war on America in the future so I can see a F-22 shoot down one of the JDF’s 60 year old British aircraft hand-me-downs, I’d like to make the transition to the afterlife with that kind of bang :D.
amazing pieces of tech i tell you. A war machine non the less but amazing. America is behind on war tech though. I remember reading about Europe having their war machines on a neural grid which enables each jet to learn from the other jet.. that is. your literally fighting a fleet and not a jet to jet battle, same for tanks etc.. Japan doesn’t need a raptor though.. it’ll have a gundam soon either way. yeh these are super aircrafts. i mean the few air force jets i’ve seen fly by in the UK, USA and here in SA make me just stare in awe, and i’m sure they pale in comparison. but i don’t blame the US at all. if u have an advantage why give it away, see what happened in the motor vehicle sector. plus i guess there are a few ancients who still remember the Axis powers of WWII and are secretly suspicious. as for the Jamaica/USA war – could you kindly not blow my little country away while I am not even there. but who to tell if we’d lose…..maybe unleashing some of our downtown terrors in metro-style war cud be a plus even for a short while. Imagine arming some of our shottas and telling them…ok i know we been telling u to stop shooting up di place but dis time leggo shot all u want. Americans are smart. Always want to appear superior. They cant sell easily their tec. Oh please, America would never give outsell their best technology to another country, its all about their superiority. As for a Jamaica-US war, it sounds like you have a death wish! Yup, the US got their own reasons.. Thats why they should turn to Russia.. Buy Sukhoi..